Price hasn't been announced yet, but this is great news for those that enjoy these old SEGA IPs, as well as the 3D treatment Nintendo already gave some of their classics with the "3D Classics" series. Awesome. Looking forward to trying these out. At least Sonic and Space Harrier to begin with. You're just all about swiping news from my posts today, aren't you Grant? There's more than one of those I want to play for the first time (or again in some cases). I only wish one (or both) of the Shining Force games were on that list. The 3D when the actual fight portions of the battles happen would look pretty slick in 3D (think Fire Emblem Awakening). I'm probably down for Sonic. And everyone seems to love Shinobi. I read that as, "Sega CD Classics coming to America." SEGA SEGA SEGA HOORAY!!! I'll likely get several of these. Nah, don't lock this. I posted in the ND thread for this week once I read the news about both. Too bad that @kriswright isn't here with us anymore, I think he'd enjoy this news. Ah, gotcha. I haven't been to that thread after I read it in the morning. Wasn't poaching, honest! I would buy Streets of Rage if it allows local download play. Really should be SoR2 though. Is Altered Beast a "classic" in the same way that Urban Champion is a "classic"...? Well, they're both definitely "mature", by the true definition of THAT word. @Mop it up That's probably the most charitable way of putting it. As for these, I probably won't pick any up. And make sure to check out impressions for each one before buying, Siliconera seemed underwhelmed by 3D Sonic. They're coming tomorrow! At least some of them! 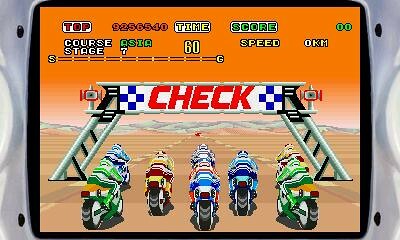 I'm strangely psyched for playing Super Hang-On and Space Harrier in 3D. I've only played ports of the arcade games for a couple of minutes, never experienced them in the arcades. But they manage to make the 3DS ports really exciting in this interview, and this one. I really want to check out Space Harrier tomorrow, but I'll see if my wallet/backlog will allow me. Space Harrier is a game I remember playing and liking, but it's been many, many years since I've touched it. But it's basically the proto-Kid Icarus Uprising. And it's SEGA. So I'm probably down for giving it a spin. I always saw Space Harrier as the proto Star Fox, but maybe Kid Icarus Uprising is more fitting. Last time I played it was, like, twelve years ago or something, in Shenmue.